Nikon Coolpix P900 Manual is aimed to fulfill the needs toward information of both technical or instrumental issue among this digital camera product especially for Nikon Coolpix P900. Nikon Coolpix P900 has a powerful 83x optical zoom (24-2000mm equivalent) NIKKOR ED glass lens with the ability to reach 166x using Dynamic Fine Zoom and a super extra-low dispersion (ED) glass element, making this camera ideal for capturing sharp images and videos from extreme lengths. Standard ISO range starts at a base sensitivity of 100 and rises to a maximum of 1600 in scene or other automatic shooting modes. This model also offers a standard, modern set of features including Full HD recording (1920 x 1080) at 60 frames per seconds, as well as 30fps (or 50p and 25p in PAL mode). 720p resolution is also available at 60p/30p (50p/25p) as is a neat slow-motion video mode that captures at up 120 frames per second at VGA (640 x 480) resolution. Most important point that this model also embedded 802.11bg and NFC technology which is allows users to share photos from the camera to a compatible smartphone or tablet via built-in Wi-Fi and NFC connectivity. When Nikon Coolpix P900 was firstly released to the market? How much the price when Nikon Coolpix P900 firstly released? Nikon Coolpix P900 is a good choice for anyone who wants an easy to use camera that delivers good-looking pictures with pleasing color and plenty of resolution. It was announced by Nikon on March 2, 2015. In the first release, The Nikon Coolpix P900 pricing set at about $599.95 body-only. Now, if you’re interested to own this compact digital camera device, you can get it in several online stores by paying $421.36 for the Nikon COOLPIX P900 Digital Camera with 83x Optical Zoom and Built-In Wi-Fi(Black), and about $599.94 with 64GB Card. As for the used products start from $421.36. digital camera especially of Coolpix P900 models. Read this manual thoroughly before use, and keep it where all those who use the product will read it. 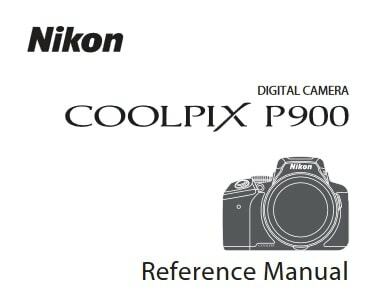 Feel free to download the nikon coolpix P900 manual user guide at below.